The flash floods have brought to the fore the failure of the administration in anticipating the aftermath of the cyclone as severe floods hit major parts of South Odisha on Friday. BHUBANESWAR: Even as the State Government remained preoccupied with the target to ensure zero casualty during the very severe cyclone Titli, it was taken completely unawares by the flash floods which has affected around 38.7 lakh people and rendered thousands homeless. The flash floods have brought to the fore the failure of the administration in anticipating the aftermath of the cyclone as severe floods hit major parts of South Odisha on Friday. Ganjam, Gajapati and Rayagada districts, which had already been battered by the cyclone, are the worst affected in the floods. Floods waters have submerged a large part of Aska and Chikiti towns along with many other areas of Ganjam district. Flood water in Aska reached a height of 10 ft submerging houses completely. The flood has been caused by sudden release of water from Randighai barrage of Bhanjanagar. The administration was not prepared for the heavy rains brought down by Titli that caused the reservoir to swell beyond capacity. Meanwhile, the Bansadhara river at Kashinagar has crossed the danger level of 54.95 metre while Rushikulya at Purushottampur was flowing at 18.4 metre against the danger level of 16.83 metre. Jalaka river was also flowing above the danger level of 5.5 metre. 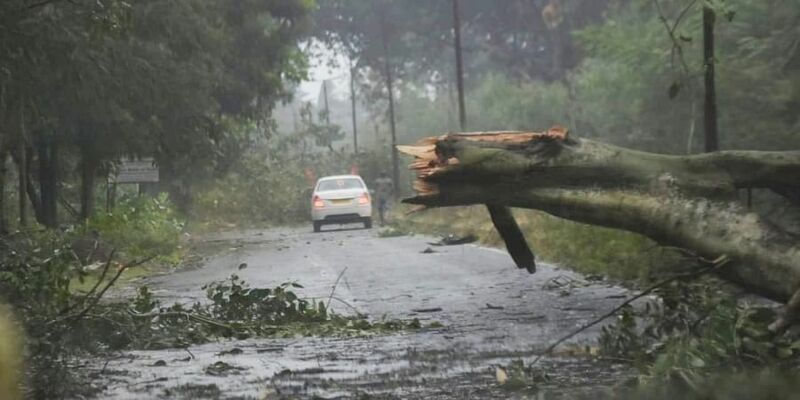 Ganjam Collector Vijay Amrita Kulange said, “More than one lakh people from the district have been evacuated to safer places.” The situation in Gajapati, the worst hit by the cyclone, is also grim where around 205 mm rainfall have been recorded in the last 24 hours. Around 13,000 people of several villages in Kashinagar and Goshani blocks have been affected in the district. The landslide occurred in Gangabada panchayat under Raygada block of the district affecting many people, Collector Sudhansu Mohan Samal said. The neighbouring Rayagada district was also left battling serious flood situation as the Bansadhara wreaked havoc in Gunupur block. Two persons working in a marble factory in Labanyagada panchayat of Goshani block died in a wall collapse, Collector Guha Poonam Tapas Kumar said. The office of the Special Relief Commissioner (SRC) informed that floods have damaged 1,512 houses in Ganjam, Gajapati, Rayagada, Puri, Kandhamal, Kendrapara and other districts. It has also damaged crops in 85 thousand hectares in these districts. Floods in Rushikulya and its tributary Bada Nadi have inundated several villages in Hinjili, Aska, Purushottampur, Chhatrapur, Bhanjanagar, Chikiti, Digapahandi and Patrapur areas of Ganjam. The swelling Mahendratanaya river submerged vast stretches of Gajapati district cutting off road communication between Andhra Pradesh and Paralakhemundi in Odisha. Train services too were affected as at least 16 trains were cancelled and several others rescheduled by East Coast Railway (ECoR) on Friday due to submergence of railway tracks. Chief Minister Naveen Patnaik reviewed the situation in a video conference with the district collectors of Ganjam, Gajapati and Rayagada. He asked the collectors to intensify rescue and relief operations on a war footing. He constituted a three-member ministerial committee comprising Revenue and Disaster Management Minister Maheswar Mohanty, Water Resources Minister Niranjan Pujari and Energy Minister Sushant Singh to visit the three worst affected districts to monitor rescue and relief operations. Two helicopters have been requisitioned from the Indian Navy for rescue and air dropping of relief materials in villages located in 125 panchayats of Ganjam district as these areas are cut off due to the submergence of roads, Chief Secretary AP Padhi said. Chief Minister Naveen Patnaik will make an aerial survey of the Titli affected Ganjam, Gajapati and Rayagada districts at 11 am on Saturday. He directed Finance Minister Sashi Bhusan Behera and SC and ST Development Minister Ramesh Majhi to proceed to Kandhamal.